We all enjoy spotting a free wild animal like a shy duiker but such sights will become more rare as unfortunately their numbers are sadly declining. Our remaining and limited local wildlife often endure horrific suffering and untimely deaths, due to ever-increasing incidents involving either being trapped inside fenced areas; injured by fencing; chased by dogs; hunted and snared; injured or usually, killed, by traffic; deprived of access to natural water sources; etc., all as a result of the encroachment of humans into their natural habitat. Sisal plants, Agave sisalana, a declared invasive, causes painful injuries and suffering to wildlife when they are chased into these and this is getting worse due to the invasive growth of these plants. If you see any person/persons with wildlife carcass/es or snares, etc., please note where the suspects are heading and phone SA CAN immediately 086-162-3646. They will contact Ezemvelo and the Police dog unit. 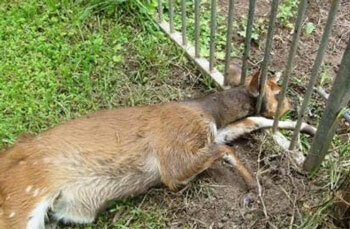 Location of set or sprung snares and other wildlife incidents can also be reported to SA CAN 086-162-3646. Note: During the recent combined Hillcrest rail reserve clean up, Hillcrest Park Neighbourhood Watch removed a snare found in a railway culvert along Springside Road near Park Close (a built-up area but close to Springside Nature Reserve).